The Mission: Determine whether our comfy and right-sized but beat-up sofa is worth recovering. The Research: Hello, internet! Unfortunately, most advice concerns whether a piece is worth paying an upholsterer to refinish. That work can be as expensive as a new, mid-quality couch, so the sofa in question better be up to snuff. Upholsterers, I love ya, but this is going to be an inside job! This couch doesn’t need to be tip-top quality to make it worth the effort. Convinced that there had to be a middle ground, I did some more research and created a three-item checklist for whether an otherwise likeable couch is worth DIY reupholstering or slipcovering. 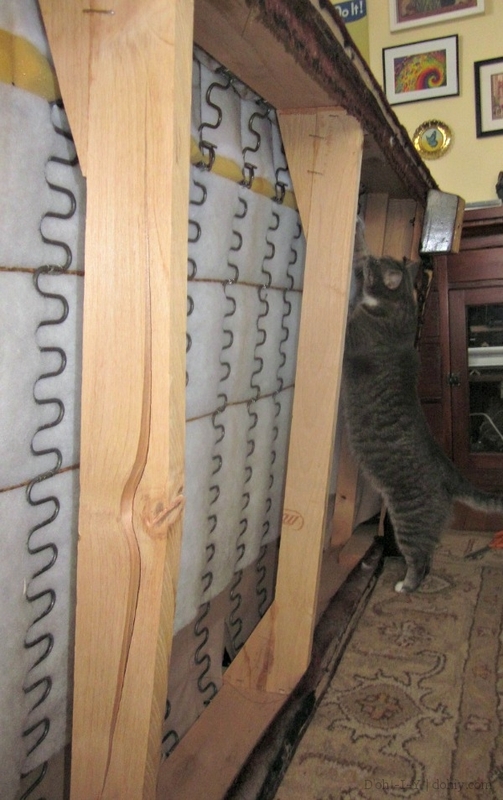 Frame Construction–is the frame made of actual wood and/or steel? How is it fastened together? Are the joints tight? Frame State–when you use the piece, does the frame sag? If you shake the arms, can you make it wobble? Are the framing members secured fastened and square to one another? Does the frame squeak or groan when you use the sofa? Spring Quality–does it even have springs? Are they coiled or flat? Are they resilient? Are they uniformly tight against their under-cushion covering? Are they connected to the frame? Are the ties intact and tight? With my checklist in hand, I tackled our couch (much to the consternation of the cats). First, I grabbed each arm and shook it violently. Nothing wobbled (and I already know that flopping on the thing doesn’t make it shake). So far so good — solid and quiet. 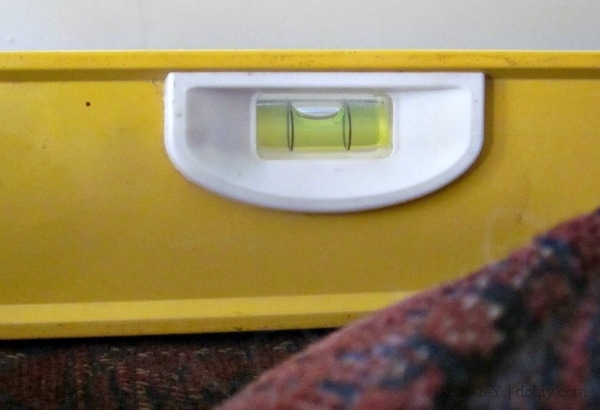 Next, I checked the level on the floor — not much in the house is square, so it wouldn’t be fair to fault the couch for not being level if it were sitting on a slanty floor. Floor was not bad, quelle surprise! So I checked the level for the back and the front apron. Those were both fine. 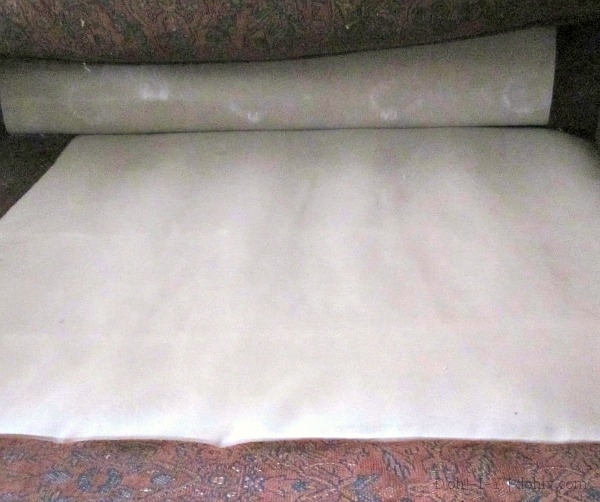 Next, I flipped the couch up and removed the dust sheet covering the undercarriage, which was surprisingly intact. The cats thought I’d opened a portal to another dimension. I looked closely at the construction. 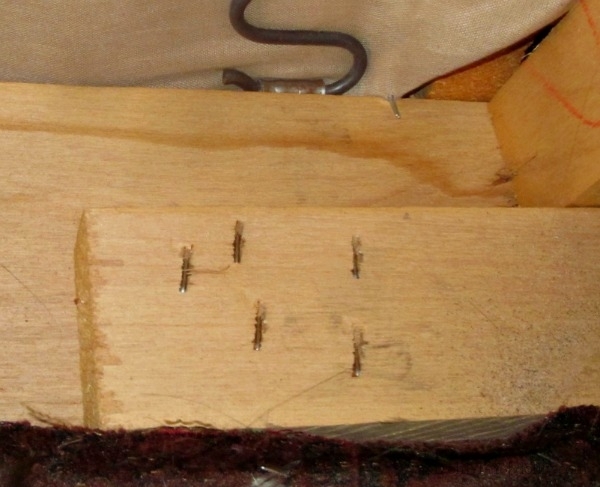 Turns out it is all substantial wood, but it’s mainly glued/stapled together. Despite the crack, the top of the flawed framing piece is still straight and square, and the frame doesn’t give. If we were to sister up another piece with this part of the frame and bolt through them both, that would fix it. That takes care of the framing items on the checklist. On to springs! This sofa has flat springs, which aren’t as fancy as coils, but they are a pretty big gauge and still resilient. 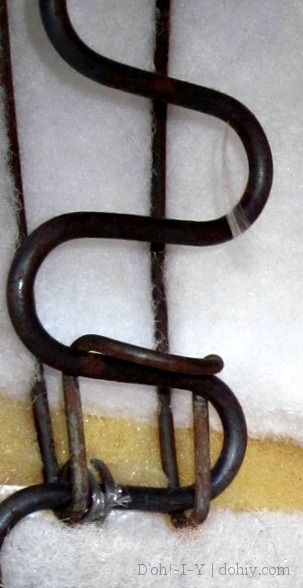 They are attached to the frame via a hook arrangement that appears to be in good shape. The springs themselves are unbroken and evenly spaced and arched. The springs are also smooth against their cover on the cushion side. So I’d say the springs are ok. I didn’t include anything about cushions in the checklist because cushions can be replaced. 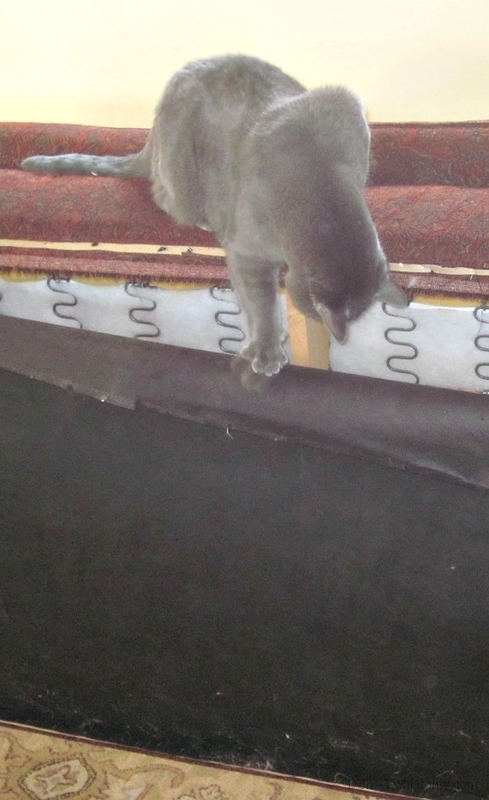 But I did check the sofa’s existing cushions to see how they were doing, using the highly technical Bounceback Squeeze Test. These cushions are a down/foam combo. The foam is high-density and doesn’t seem to have lost its body. The down could be springier in places, but I have some down on hand so I could add some fluff. I’ll also vacuum and steam the cushions to revitalize them. Regrettably, the back cushions are sewn to the cover. In order to slipcover the cushions individually (and to cover the sofa itself), I’ll have to cut the covers away. On the plus side, there are cushions zipped inside these capsules, so I won’t have to rebuild them. It’s a bit of a mixed bag. The frame is stapled…but it’s solid and square. It uses flat springs…but they are still springy. There’s a cracked frame member…but it’s an easy fix. To be honest, I held out a small hope that the thing would be a disaster underneath because buying a sofa is hella easier than recovering one! But this one is in good shape. Let the recovering begin! Yaaaaaaaaay. This entry was posted in Decor, Furniture, Repair & Maintenance and tagged DIY reupholstery, how to tell if a sofa is worth reupholstering, is my couch worth reupholstering, reupholstering a couch, reupholstering a sofa, slipcovering a couch, slipcoving a sofa. Bookmark the permalink.